You cannot have too much Monk. Even Monk on an average night is worth hearing. Monk on a great night is a must. 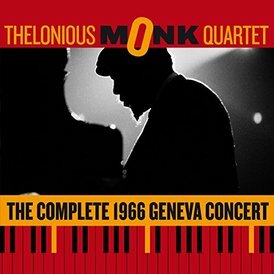 This Geneva concert is Monk on a great night. Thelonious Monk went through many phases. In the forties he was known only to a select few. In the fifties he started to be recognised. In the sixties, after he signed a contract with Columbia and began to tour widely, he was taken for granted, even denigrated. Such a fate seems unjust and, on the evidence of this concert, unwarranted. Monk was an extraordinary figure. Those who saw him never forgot the experience. The generous album notes that accompany this music contain a description of Monk by Argentinian writer, Julio Cortazar, that is quoted at length and is probably the best description of the enigmatic completely unique musician. Cortazar was present at the Geneva concert and in his opinion Monk that night was ‘on’. Monk’s music has lasted well. The curious compositions, once considered so weird are now seen as unique creations. Cortazar is right, the music from Monk in Geneva is extraordinary. The idiosyncratic timing and matchless uncanny note placement is displayed in piece after piece. Joyous energy animates Monk’s solo on ‘Off Minor’. Humphrey Lyttleton once described Monk as playing like a superb musical mind who has just sat down at the piano for the first time. Charlie Rouse is given as much, if not more, space as Monk and he uses it well. His understanding of the quirks of the Monk tunes was unrivalled. His unique playing with his butterscotch tone has been shamefully underestimated. Often Monk ceases to play behind Rouse leaving him free but when he does accompany it is always worth hearing, the notes he picks out are strange but right. Larry Gales on bass is featured extensively, probably more than necessary. The solos are lengthy and do not add much to the overall effect. Drummer Ben Riley keeps time well and for the most part keeps out of the way. The final two pieces are’bonuses’ taken from a quartet date at the Blue Note in Philadelphia in 1956. They feature: Paul Chambers, Willie Jones and Ernie Henry. The recording quality from both Geneva and Philadelphia is bright and more than adequate. This is a record to own and cherish. You cannot have too much Monk.